Art Therapy is an evolving, researched mental health profession that combines the insights of psychotherapy with the healing potentials of the artistic creative process. Art Therapy was first introduced to Canada in the 1940’s and has since become an established therapeutic practice, with eight approved training institutes/ colleges in Canada, as well as national and provincial professional associations. Art Therapy combines creative expression with reflection. Putting feelings, thoughts, memories, visualizations, and sensations into creative form such as a painting, sculpture, or poem allows you to view your current situation in a new light, to experience and cultivate embodied, mindful awareness, and to intentionally “shape” your response to life’s challenges. 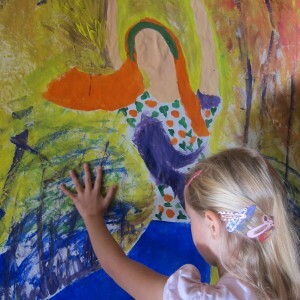 Art therapy allows for multiple learning and sensory processing styles. Art Therapy can be pleasurable and surprising. It stimulates creativity, playful exploration, and fresh perspectives. Clients can often feel energized, inspired, and rejuvenated after engaging in Art Therapy. Do I have to be artistic to do Art Therapy? You do not have to have any prior artistic experience or art-making ability to benefit from Art Therapy. In fact, one of Art Therapy’s advantages is that it engages and cultivates our often under-used “ways of knowing”! For example, if we are adept talkers and prone to over-analyzing, Art Therapy offers a different “doorway” into our experience. Connecting to our perceptions in this way can offer unexpected insights and resources. Are there any risks associated with the Art Therapy process? Like in any counselling and psychological work, there may be periods in the therapy when you feel worse before feeling better. Painful emotions or memories may be activated. Often this period of hard work will lessen and you may begin to notice favorable changes. If it does not, it is important to discuss this with your therapist. Is the Art Therapist going to “interpret” my art? Your Art Therapist is trained to look at your images with care, curiosity, and respect. The Art Therapist will assist you to express and share what is most important to you. At no point will your Art be used as a diagnosis tool. During your therapy, your images are stored in a safe and confidential manner. What training do Art Therapists have? Art Therapists require post-baccalaureate or graduate training in Art Therapy. This involves study both in psychology and the arts, and involves extensive academic work, practicum experience, and ongoing supervision with a Registered Art Therapist after graduation. Art Therapists are expected to continue their professional development throughout their practice to remain current in their field. Many Art Therapists have additional training in other therapeutic modalities, and may have other professional designations such as Clinical Counselor, Social Worker, Pastoral Counselor, or Psychologist. What can I expect when I come to my first Art Therapy session? You will have an opportunity to ask any questions you may have about Art Therapy. The Art Therapist will introduce you to the Art Therapy process. You will be introduced to the space and the materials. Most importantly, the Art Therapist will want to gain some understanding of the concerns and issues you bring to the Therapy. You may choose to make Art in the first session or you may choose to talk with your therapist for some time before you are comfortable making imagery. Does the art in Art Therapy always have to be visual art? No, it does not. There are multiple ways to be creative. Am I expected to make Art in every session? No, you are not. There may be stretches in your therapeutic process when you do not make much art at all, while at other points the art making may be central to your therapeutic work. I would love to help! Please contact me!